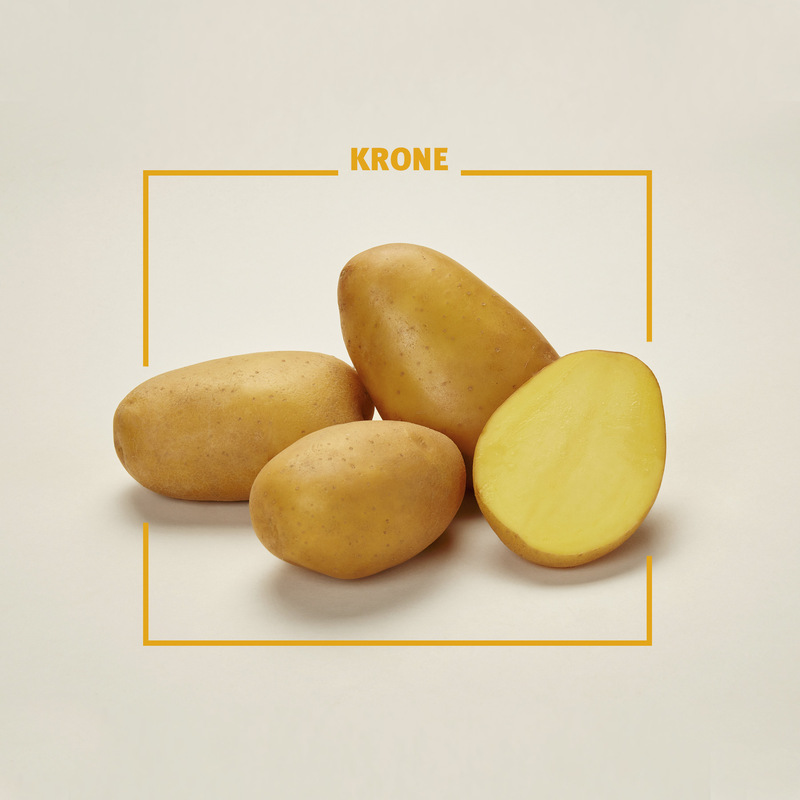 Krone is a robust variety with very good storability. yields even under dry conditions. Cooking type B, excellent taste, no discoloration after cooking, easily washable, very suitable for prepacking, very low sensitivity to mechanical damage, starch content 12 – 13 %. High number of tubers, very uniform grading, very high marketable yield. Oval to long-oval, light yellow skin, smooth shallow eyes, yellow flesh colour. Medium tall, white flowers, foliage development medium. Krone has a high nitrogen efficiency, so N-fertilisation should be reduced (130 – 140 kg max. including N min.) Phosphorus: 100 kg / ha Potassium: 250 – 300 kg / ha (preferably sulphate) Magnesium: 80 kg / ha by low pH-value addition of micronutrients. Krone is not sensitive to Metribuzin. Routine protective control of late blight is recommended, addition of a fungicide to chemical haulm killing. Krone must be senescing before haulm killing. Take care that skin set is finished before harvest. Good dormancy, good suitable for a long term storage.